The chart below tells you everything you need to know about the House Republican bill (AHCA) to repeal and replace the Affordable Care Act (ACA). 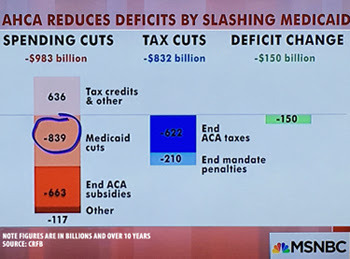 “They took $800 billion for health care from the poorest among us,” said Joe Scarborough on Morning Joe, “and they gave $600 billion in tax cuts for the wealthiest among us.” That’s what this healthcare bill is. 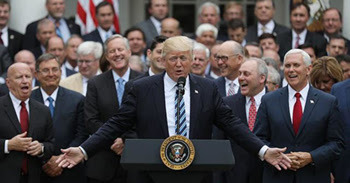 In late March, after considerable public pressure, House Republicans abandoned a bill that would have repealed the Affordable Care Act (ACA). Many of us felt that the country had dodged a bullet, and hoped President Trump and the Republicans might lose interest and move on to tax reform and border walls. Instead, the ideological conservatives reorganized, brought forward an even more draconian measure, and pushed it through without any hearings, any analysis of its fiscal impact, and without any semblance of debate to show that they even knew what was in the bill. The influence of the hardline “Freedom Caucus,” including local Representatives Brat and Garrett, was on full display in passing a bill much worse than the measure that previously failed. If the Senate were to embrace the House measure, the impacts would be significant for Virginians, and create headaches for state policymakers. When the Affordable Care Act was passed in 2010, then-House Budget Committee Chair Paul Ryan remarked, “I don’t think we should pass bills that we haven’t read and we don’t know what they cost.” Yet that is exactly what House Republicans did on Thursday. We are now discovering more about the bill, and it isn’t pretty. The costs of the bill have not been “scored” by the Congressional Budget Office so we are not clear about the full scope of its human or fiscal implications. The earlier bill would likely have led to 24 million people losing coverage; no estimate has yet been set for the new measure, but given the cuts in subsidies, it is clear that millions will lose benefits, including at many as 400,000 Virginians. The subsidies at the heart of ACA will be reduced, lessening the ability of our citizens to purchase insurance on the exchanges. That Republicans would pass a measure that affects such a large portion of the economy without knowing the costs or impacts will continue to haunt them as the public becomes more aware of its problems. Since the bill repeals many of the financing mechanisms underpinning the ACA, it creates a massive tax break for the wealthiest Americans; some taxpayers would receive as much as $7 million per year in tax breaks. One major impetus for this bill was to cut Medicaid, and the measure creates huge problems for the states as the federal government abandons the funding arrangements that have been in place for fifty years. Virginia is projected to lose as much as $708.9 million in Medicaid funding between fiscal years 2020 and 2026 because the new funding formula would impose either a “per capita cap” or a block grant approach on federal reimbursements to the states. This will create huge dilemmas for state leaders, who will need to decide whether to reduce Medicaid benefits, eliminate recipients, cut provider rates, or transfer funds from other essential services to address funding shortfalls. The proposed changes will largely have the greatest impact on the elderly and disabled, who account for two-thirds of Medicaid costs. These “caps” or block grants will put pressure on the General Assembly to roll back recent initiatives in the area of mental health and for veterans. It will also make it more difficult for us to add more assistance for citizens with special needs, a high priority for the legislature for the past several years. Two major features of the bill involve treatment of those with pre-existing conditions and altering the “essential health benefits” standards set forth in the ACA. Rather than confronting these directly, Congress has pushed these issues onto the states. In that way, Congress and Trump can attempt to have their cake and eat it too; they can assert they have not affected insurance for those with pre-existing conditions, because they are leaving the decision to the states. Depending on what Virginia and other states do, however, insurers may again be able to charge more for people with pre-existing conditions, or place annual and lifetime limits on coverage for people covered by individual insurance plans or an employer’s plan. Hence, our citizens could have their insurance coverage end – for good – in the middle of a serious illness. Imagine the life and death choices that citizens in that situation will face! Similarly, the act allows states to waive standards that govern what services must be covered in the individual and small group insurance markets (remember when pregnancy services were not considered an essential health benefit?). These provisions place state legislatures, including Virginia, in a terrible dilemma. With the individual mandate obliterated, insurance providers will find it more financially difficult to offer reasonably priced insurance products in states, with the result that more will exit the marketplace—unless, of course, they can jettison the most costly of the insured, those with preexisting conditions—by getting statehouses to eliminate this requirement. To do this under the House bill, Virginia would need to seek a waiver of ACA’s prohibition against insurance companies charging higher premiums to people with pre-existing conditions. While the Commonwealth would then be eligible to receive federal subsidies to help create “high risk” insurance pools for citizens removed from coverage, most commentators believe these monies will be totally inadequate to meet the need (AARP estimates that premiums in these pools could be as high as $25,700 per year). The states, then, will be left in a more fiscally perilous position while their citizens will have to pay dramatically higher premiums for a less valuable product. If the Commonwealth does not seek this waiver, the status quo remains as to pre-existing conditions, but those who are most vulnerable will still have to pay more for coverage because their subsidies have been reduced. The House bill allows insurers to charge aging citizens premiums up to 5 times higher than younger consumers. The Congressional Budget Office projected that insurance rates for people aged 55 to 64 will double. Is it any wonder that everyone from the American Medical Association to AARP opposed the bill? The bill also includes a provision to slash Medicaid reimbursements to Planned Parenthood. Democrats in the General Assembly have predicted these problems for months, and have challenged our Republican colleagues to reject the approach embodied in “Trumpcare.” In early January, I asked my Republican colleagues in the House of Delegates to sign a letter addressed to our Congressional delegation expressing concerns about the fiscal impacts on our Commonwealth of a repeal of the ACA. You can download the letter here (pdf). Not one Republican delegate signed; instead, they continued to repeat the “repeal and replace” mantra that has now found its form in this heartless, fiscally irresponsible, and wrongheaded legislation. Now, we have thousands of Virginia citizens in considerable jeopardy. And Republicans can only make it worse in the next General Assembly session. That is why we must not only fight against passing this bill in the U.S. Senate, but work to elect more Democrats to the House of Delegates this fall. Republicans have yet to show they can respond to our health care challenges without simply cutting benefits, transferring money to the rich, or placing undue burdens on the states. Such an approach must be rejected at every opportunity.